No artwork? - No problem. No charge. We'll create a professional form for you. Feedback : 800 positive, zero negative! We use only 'market leader' branded materials printed on modern high speed litho presses. We use only Giroform NCR paper - the market leader. 80gsm throughout for 2 part and 3 part. 4 part and above will often use lighter weight middle sheets to aid impression transfer. Giroform gives a guaranteed 10 year image life. Our NCR books are wire stitched, perforated and tape-bound and will not come apart even under the most demanding conditions. Heavy weight manilla card cover. Rigid 1200 micron greyboard base. Bottom sheet normally fixed in book but all sheets can be perfed. Headbound as standard to suit both left and right handed users. Blocks of 50 sets gummed together. Each set is removed after use. Manilla cover board is used as impression shield. Individual glued NCR sets supplied loose in a box. We will design your custom form to your exact requirements entirely for free! Our designers are very experienced and it doesn't take long to design a professional form for any purpose. Just give us the information and after you order we'll create your form. We don't print until you are completely satisfied that your form is exactly as you want it and you have approved your final proof. There really is no hidden catch - this is what we do. We are an eBay member, our customer feedback is 100% positive. Over the last twelve months we have received a 5 Star rating in all areas. See for yourself the quality of our printing and the materials we use. Also see how our templates look when printed and assess the standard of our design work. We are a specialist litho forms printer operating a highly streamlined production system. We exclusively print forms and have developed a highly specialised litho based production workflow. Litho is the best quality, fastest and cheapest method of printing forms. We own and operate about 30 tons of precision, industrial grade, forms production equipment. We serve the whole UK and deliver nationwide so there are significant economies of scale and repetition that can't be gained from a local market. Our workflow and software systems are custom built, fully integrated and designed to produce a large number of physically similar and yet individual NCR jobs. Thus minimising organisational overhead, waste and production errors. Our input material costs are minimised because we buy a large amount of the same thing. and we absolutely do not compromise on quality or service. We are capable of producing about 5 tons of print in a single day. We never do, but this significant capacity means you shouldn't find us "unable to cope". 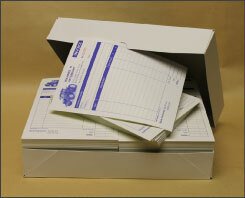 Caralan have been suppliers of litho printed NCR forms to the UK printing trade for over 30 years. Our IT, management and production systems are well developed and highly streamlined. This means we can reliably supply the highest quality litho printed NCR forms to the trade at prices that our competitors, whether litho or digital, can rarely match. Once you tell us you are a reseller all your subsequent orders will be flagged on our workflow system for "White Label" service. You can then dropship with confidence knowing the recipient will be unable to identify Caralan as the production or despatch location. 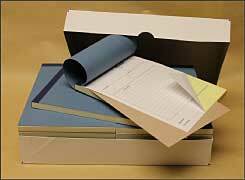 If you wish to supply your own documentation or specific packaging requirements we can usually handle that too. With the introduction of GDPR, the Snowden revelations and the many well publicised corporate data breaches there is more public concern about data security than ever before. We do not collect information beyond what we need to conduct our business. We will never intentionally divulge any information you give us to any third party except when we need to do so in order to conduct our own business, or when we are required to do so by a legitimate authority. We take reasonable care to protect your information against unauthorised access. We do not collect or store your card details and online payments are taken through a payment portal, either HSBC Global Payments or Paypal. Other than the payment portals mentioned we do not allow the collection of data via our website that can be used by any third party to identify or track you and we will not knowingly allow third parties to run code on our systems or your browser via our website. We do not allow third party cookies or local storage and our site sets only a single "Session Only" (non-persistent) cookie for the basket. All requests to our website are automatically directed to secure pages, ie we effectively do not allow insecure connections. Our website has no concept of "Account Login" and so we do not collect your passwords. Click your browser padlock icon for more information. If you wish to inspect or remove any of your data please email info@caralanforms.co.uk. Our customers are almost all businesses and organisations. Consequently most of the data we hold is already in the public domain and we don't have any interest in collecting your personal information. We aren't interested in your age, gender, income group or personal contact details and our IT systems are not designed with the capability to collect, hold or process this type of data.